USDA-NASS reported that 44% of Nebraska's corn was planted as of May 4, near the 45% average; 7% had emerged. 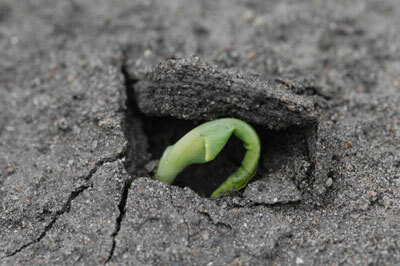 A week earlier, 20% had been planted and 2% had emerged. As we write this planting both corn and soybeans continues at full speed – rain is forecast. No doubt we'll see a dramatic increase in planting progress this week both for corn and soybean. Corn needs between 90 and 120 GDD to emerge. According to current GDD accumulations across the state, the 4% of Nebraska's corn planted on or before April 22 (USDA NASS 21 April) has received enough heat to germinate and emerge. Since plant population is one of the key factors influencing final corn yield, it's time to start counting and scouting! Stand Counts. Assess emerging stands to determine early seedling populations. Use Table 1 to determine row lengths needed for various row widths that represent 1/1000 of an acre. Count the plants in the row and multiply that by 1000 to calculate plants per acre. Do this several times in the field. Seed/Plant Attrition. Compare the plant populations calculated from your fields to what you intended to plant; calculate your attrition losses. Typical losses from planting to final stands in our University research trials ran between 4% and 7%. That's probably mostly due to poor germination. But, final stands are within 1% to 4% of seeding rates for top managers. If your attrition losses range up to 10% or more, investigate the reasons. You'll need to dig for seeds or seedlings to determine what happened. Seed viability: Perhaps the seed lot had poor germination ratings from the start. Check the seed tag and/or run your own germination test. Pathogens causing seedling diseases are heavily dependent on specific weather conditions. Some pathogens prefer wet versus dry conditions, while others prefer warmer versus cooler temperatures. When replanting is necessary, it's hoped that weather conditions that supported the initial seedling disease will have changed enough to avoid disease problems in the second planting. Compaction and soil crusting: Both side wall compaction and surface crusting can inhibit seedling emergence. Cold soils: Soil temperatures have increased considerably in the last few weeks. However, some early-planted corn may have been subjected to imbibitional chilling resulting from absorbing water from cold soils within 48 hours of planting. This could reduce populations. For more information, see the recent Crop Watch article on imbibitional chilling injury for corn. Expect delayed emergence in no-tilled fields with heavy corn residue from the previous year. Surface residue delays the rise in soil temperature compared to disked, strip- or ridge-tilled fields and fields that were planted with soybean in the previous year. Scout for weed management issues. 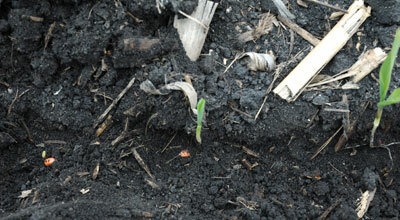 Scout weeds within two weeks of corn emergence to evaluate efficacy of burndown and pre-emergence herbicides. Some of Nebraska's early-emerging weeds, such as giant ragweed and marestail must be controlled using burndown and/ or pre-emergence herbicides to avoid early-season competition. The need and timing of post-emergence herbicide can be manipulated based on weed density and size. In fields with only post-emergence herbicides, weed competition on the crop is greater early in the season than it is with herbicide programs using burndown or pre-emergence herbicides. Incorporate herbicides with different sites of action into your herbicide program. Several residual herbicides are registered in corn that can be applied after corn emergence in a tank mix with post-emergence herbicides. These provide effective control of later emerging weeds such as common waterhemp and velvetleaf. In addition, tank mixtures will provide an additional site of action to control glyphosate-resistant weeds. For more information about herbicide options, see the 2014 Guide for Weed Management in Nebraska (EC130). Learn from your observations. As you understand the causes of poor stands, think about what can be done at that time and perhaps more importantly, what can be done next year to prevent these problems. Replanting may be an option. Replanting may be necessary if populations are low but not necessarily if plants have emerged but are not uniform. Although we know that variable plant heights or development will likely reduce yield potential, it's not a reason to replant. In most cases, loses due to lack of plant uniformity will be more than outweighed by losses due to delayed planting. Plant height differences may reflect lack of uniformity in emergence timing or other issues the plants faced. In any case, we can't justify replanting simply based on uneven emergence, variable plant heights, or lack of similar developmental stages. However, replanting may be necessary with reduced plant populations. To determine the need for replanting, first estimate stands as we mentioned above. Then, use Table 2 to estimate yield potential. The most important factor in deciding whether to replant is to calculate expected yield with the current stand versus what you could potentially have if you replanted. Table 2 provides some guidelines for this decision. Please note that Table 2 was developed from Iowa rainfed production systems which are similar to Nebraska's irrigated production areas. Plant population recommendations are thus higher than in rainfed Nebraska systems and may not be appropriate for use in those conditions. See this 2012 Crop Watch for western Nebraska dryland corn population information. Lastly, estimate replanting costs. Consider costs of tillage, seed, fuel, additional pesticides, and labor. Consider also that delayed planting certainly means higher grain moisture at harvest and the possibility of fall frosts before physiological maturity. You may want to consider planting a shorter season hybrid seed. Caution: Before replanting, contact your crop insurance agent, Farm Service Agency, and others with an interest in your crop. One tendency we might have is to ignore fields once the seed lies "safe and secure" in the ground, but is it really safe and secure? Although we've not seen formal surveys on this, the high-yield producers we've known have something else in common: they're in the field almost daily digging, observing, taking notes, and asking questions. Scout your fields. Learn from these top producers! An example: if there are 25,000 plants per acre and the field was initially planted on 25 April and you cannot replant until May 20, it would be better to leave your present stand, which has 95% yield potential, than to replant on the 20th when the yield potential for a stand of 30,000 would be 86%. Make sure you consider replant costs in your decision. Note: Values based on preliminary Iowa research and modeling; 100% yield potential is estimated to occur with 35,000 plant population and early planting. From: Iowa State University Extension, Corn Field Guide, 2nd edition. CSI 001. 2013.